Sales and Bargains April '11 ~ Philippine Freebies, Promos, Contests and MORE! 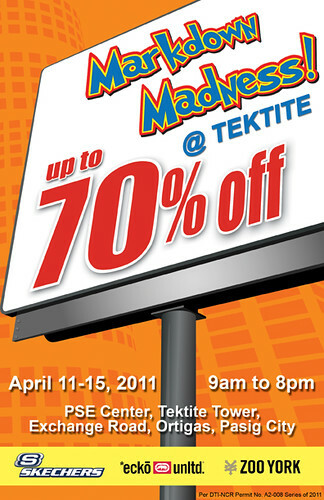 Get ready for these great summer sales and bargains this April 2011. From books at PowerBooks to camera gadgets and accessories at Pixel Pro to bazaar sales of the Markdown Madness sale and Big Outlet Sale to department store sales. Everything you need for the summer has a good deal so make sure to take advantage of it. Children and Young Adult Titles: Powerbooks Alabang Town Center, Ermita, Festival, Glorietta, Greenbelt, Mall of Asia, Megamall, Shangri-la and Trinoma.